“Venezuelan Reality and Tools to Change the World” is an exciting new course that we will offer three times in December 2009 and January 2010 at the Prout Research Institute of Venezuela. Study circles and training courses are essential to create new Proutists. However Prout is a vast theory and conveying all this information becomes boring unless it can be demonstrated to practically solve real problems. Venezuela is the perfect place to see and experience the issues that Prout addresses. President Hugo Chávez is calling for a Socialism for the 21st Century, but he admits he doesn’t know what that means. Universal health care, subsidized food, free university education, houses for the homeless, participatory planning councils and 66,000 functioning cooperatives are suddenly transforming the country. Many of the goals of the government are the same as Prout, such as economic self-reliance of each region, guaranteeing the minimum necessities of life to all, and grassroots economic planning. Yet crime, corruption, pollution, and greed are eating away at social progress and feeding the opposition’s accusations of dictatorship and ruin. Progressive Utilization Theory or PROUT is a holistic socio-economic model that is an alternative to both capitalism and communism. Conceptualized by Indian philosopher Prabhat Ranjan Sarkar (1921-1990), Prout is based on the economic self-reliance of every region, cooperatives, ecological preservation and universal ethical and spiritual values. Each morning of our course begins with a short discussion about a current global problem, such as poverty, unemployment, hunger, violence, peak oil, global warming, racism, sexism, etc. Then we examine the scope and cause of that problem in Venezuela, and analyze the government responses from a Proutistic perspective. We visit projects in the city and countryside and meet with leaders to see and experience the Bolivarian Revolution underway in Venezuela. We also listen to critics and compare the successes with the failures of this social transformation. As Proutists, our challenge is not just to understand the world, but to change it. We offer a wide array of techniques and skills for social change, including startling discussion questions, cooperative games, street theater, community listening and interviewing, how to use the media and create eye-catching images, slogans, thought exhibitions and posters to impact large numbers of people. To change the world, we also have to change ourselves. We have to be the change we want to see, “to walk our talk.” Daily classes in yoga and meditation, and our delicious vegetarian menu give tremendous clarity of mind and strength of will that all activists need. This course on Prout is the beginning of a new series we are designing in both English and Spanish: beginning, intermediate, advanced levels, and for special groups, such cooperative workers, administrators, etc. We are also planning exciting popular education projects to reach a much larger audience: a radio and TV show about cooperatives, training films, illustrated cooperative manual comic books for kids and readers with low education, a series of educational cooperative posters that can be hung in the workplace, cooperative conferences, etc. We’re making a truly professional Prout Research Institute, which has so far never existed. We concentrate our full time to researching, writing and teaching Prout. We are creating a “dream team” of Venezuelan and international volunteers, because collectively we can do so much more than we can working alone. We also want to collaborate with Proutists in other countries on projects, share our resources and inspire one another. Sarkar said, “Our Prout is Progressive Socialism,” and in fact, Venezuelan audiences appreciate the rational outlook and common sense principles of Prout. We have consistently found that doors are open and government officials are receptive to Prout’s ideas. 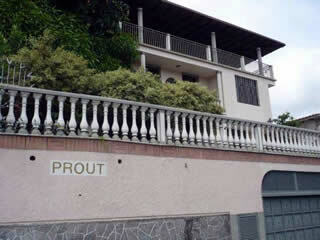 We believe that this is a historical opportunity to put Prout into practice. The first project we undertook was to design a series of 80 questions to diagnose cooperative problems and needs with the advice of cooperative experts. 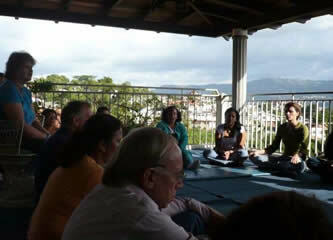 Then we interviewed 50 co-ops in the Barlovento district to determine how closely they resemble a “model” cooperative. After that Acarya Narada Muni came from Australia and produced the documentary, “Another Life is Possible: Cooperatives in Barlovento, Venezuela” that shows the successes, the problems and Prout’s recommendations how to empower cooperatives. Next we focused on a fund-raising campaign to get the permanent use of a huge, beautiful house on a hill in Caracas as a permanent office for the Institute. It has living quarters for staff, dormitories for 20 guests and students, and lush gardens. We now have mangoes, bananas, lemons, chicos, papayas, tomatoes, spinach, ginger, oregano, lemon grass, turmeric, zucchini, and we’re planting more. It is a beautiful, peaceful piece of paradise. One of our strengths is a model of Prout in Practice: Centro Madre, directed by Didi Ananda Sadhana for the last 10 years, is an example of a Master Unit Community Center, 2 hrs. from Caracas. The agricultural institute of the government (CIARA) recently inspected this project for the second time, and again rated it as excellent, a national model of small scale sustainable agriculture. Each week they bring groups to see and learn from this Master Unit enterprise. Immediately following each Prout course we have organized 4-day Work camps at Centro Madre on sustainable agriculture, Afro-Venezuelan culture and community service. The success of our project is the result of many people’s efforts, including the Ananda Marga kindergarten in Caracas which promotes Neohumanist Education. So come to Venezuela! For a short visit or to work. For more information and to see photos of past training courses visit our web site at www.priven.org or write to us at: priv prout.org. When the founder of Prout, Prabhat Ranjan Sarkar, visited Venezuela in 1979. He said: “Venezuela needs good spiritual political leaders. If Venezuela can produce spiritual political leaders, it will be not only the leader of Latin America, but also the leader of the planet.” Of course he gave similarly inspiring messages to Proutists from every country – still these words are a great encouragement to us and to all Venezuelans.